After taking over as the first female Principal of RI, Mrs Lim Lai Cheng has become the first head of the school to receive a knighthood since Sir Stamford Raffles. Ironically, despite RI’s historical ties to colonial Britain, the honour was awarded by the United Kingdom’s imperial arch rival – France. Specifically, Mrs Lim was conferred the Ordre des Palmes Académiques (Order of the Academic Palms), and is now a chevalier, or Knight. The new chevalier was recognised for her ‘major contributions to French national education and culture’, namely, initiating exchange programmes with institutions such as Sciences Po (an elite university in France), and studying French Language and Literature at the GCE “O” and “A” Levels. When told of Mrs. Lim’s achievement, Tan Jit Hui (13A01A), who will be going on a trip to Sciences Po in June, expressed surprise and fascination. Nonetheless, she felt that the honour is unlikely to radically alter students’ perception of Mrs Lim. 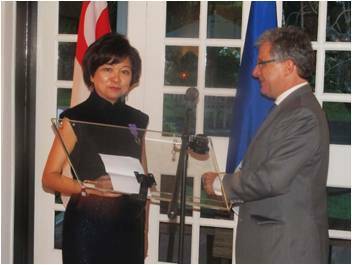 Indeed, it does not encompass Mrs Lim’s achievements in fields other than Franco-Singaporean cooperation in education. Scratch that, I love the student interviews! This is the standard of ar-le-ai students now writing essay arh. Luckily I graduated 4 years ago sia. tongue planted firmly in cheek, might I add. lol jun yan i really can’t tell if you’re mocking or praising.